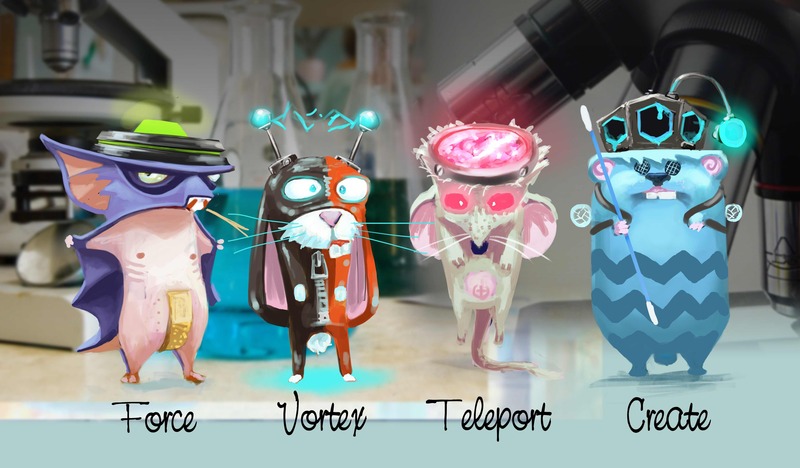 One mouse can create a rectangular brick; one can force objects away; another can use his vacuum-like vortex ability to bring objects close; and the fourth can switch places with objects by teleporting. Puzzles start with simple tasks like getting a block from point A to point B so it can activate a switch. To transport it, you’ll need to get it across gaps, around walls and away from enemies. You can see some of these abilities play out in their released trailer. Teleport can easily move an object across a gap just by looking at it and switching its place. Alternatively, you could have the Force push it across the gap while the player controlling Vortex waits on the other side to catch it. With this variety, the puzzles are designed to have multiple solutions to encourage creativity as well as allow stronger players to occasionally take charge. When the XBLAFans crew at PAX East played together, we each became experts with our powers, using them in ways the others did not expect. At other times, one of us would see a solution and explain it to the other players whose powers were needed. In every case, we took pride in our individuality to contribute to the group. One of our writers couldn’t resist high-fiving the rest of the team after solving a particularly difficult puzzle. The demo also included challenge levels to demonstrate higher-level puzzles. At the show, Spearhead had a leaderboard for a challenge to keep a ball on a suspended platform that would incline with your weight. However, parts of the platform would fall down if the ball stayed too long, forcing you to keep the ball moving around the platform without losing balance. We used the block as a barrier to keep the ball from going off the edge, while the rest of us used our powers as last-ditch efforts to pull it to safety. Even so, our best survival time was only a minute and five seconds, which came after our first attempt, which only lasted 45 seconds. To mix things up, the game has some simple hack-and-slash combat against what look like chicks. 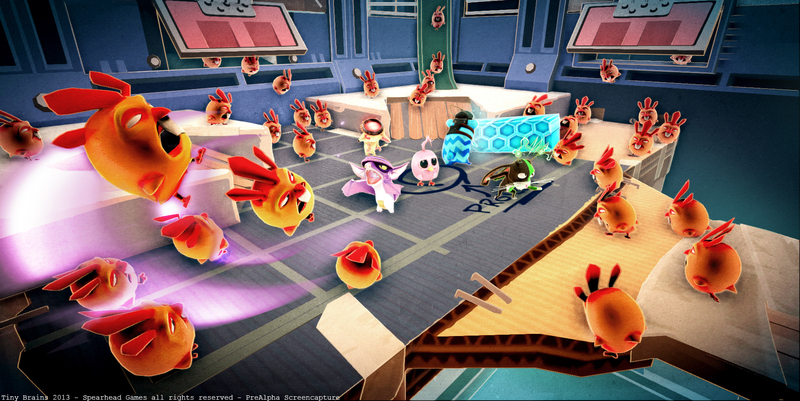 The demo we played featured a challenge in which we had to protect an innocent pink chick from wave after wave of demon chicks. Each mouse has something to bat them off with (the combat is simple and akin to the Lego games or Disney Universe), but they are also able to use their powers for more advanced moves. For example, you can team up to play sadistic ten-pin bowling by spawning a brick and shoving it into the crowds. If you’re brave, the teleporting mouse can jump off a cliff and then switch places at the last second with a group of chicks, peeping as they fall down the chasm. It’s a welcome action component that gives your brain a chance to rest from the puzzles. 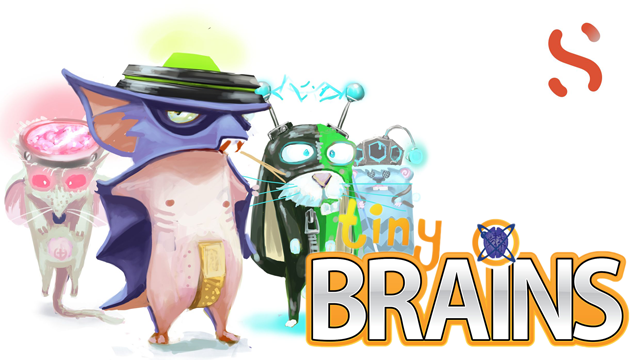 Because Tiny Brains is designed with local couch co-op in mind, it is planned to be released on consoles. Unfortunately, that’s all that’s been said officially; no specific consoles have been named. Our fingers are crossed for an XBLA announcement. 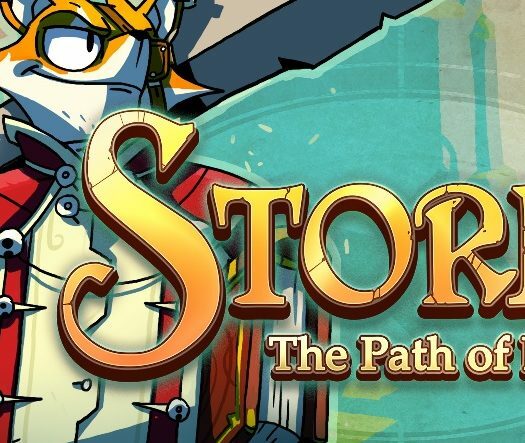 Spearhead also said it would like to include online co-op, but a.) the game has a lot of physics computations to make, so synchronizing players without lag could be problematic, and b.) it’s much more fun when the team is in the same room anyway. So, here’s the real question: will this foursome of lab rodents pave the way for a Pinky and the Brain return?